Senior Cords… Remember when we used to wear them every Friday? 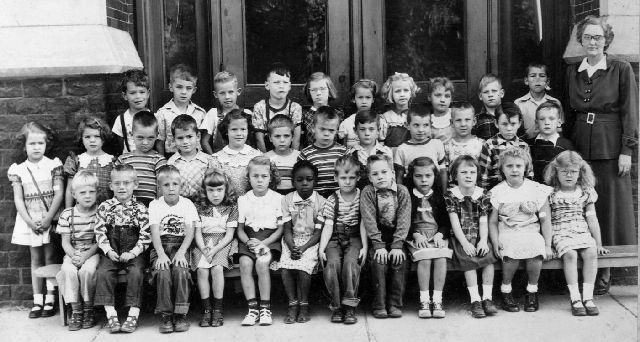 FIRST GRADE: Back Row (left to right): Douglas Johnstone, Steve Housefield, Bobby Joe Crowe, Roger Long, Mary Jane Linton, Asenith Johnston, Mary Jo Marshall, Sue Ellen Johnson, Bill Thurman, Allan Kellum, Teacher Minnie Bee Parsons. 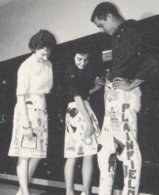 Front Row (left to right): Jerry Nichols, Larry Hopkins, Ronald McQueeney, Joy McGarrahan, Wanda Kay Kinnett, Betty Nelson, Billy Lawton, Carl Merritt, Susie Jessup, Susan Hutchens, Carol Ann Keefer, Marilyn Hodson. 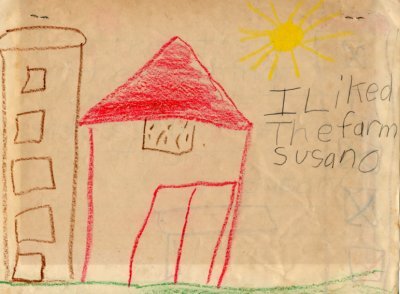 Susan Oliphant's picture/letter to my parents after first grade field trip to the Kellum farm. In addition to Susan's picture, I've got a whole bunch more.